OK, The updated text of the book will be here for the duration of the campaign. Each essay that is in the book is available by picking the Jobs Jobs Jobs menu item on the left side of the Home Page. If it is not there yet, it is because the site is still under construction. It will be soon. It's free. No kidding. Even the book's Preface, a worthwhile read as an essay unto itself is on this site. 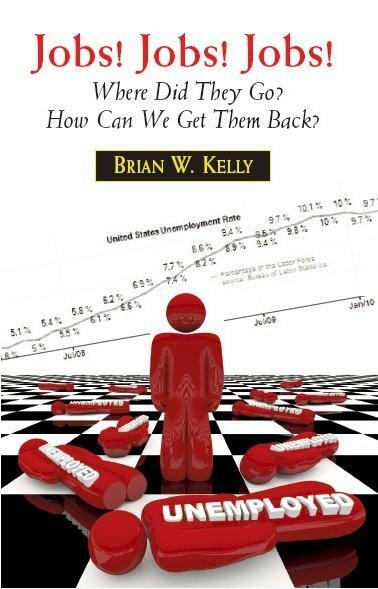 The Preface is where you should begin as it is another important essay on the Jobs! Jobs! Jobs! landscape. If you would like to get the book in paper form, feel free to take the link to www.itjungle.com/store.html. Otherwise, it is here to enjoy. Thank you for visiting the Brian Kelly for US Senate web site. As you may know, in this campaign for the Senate, unlike the campaign for Congress in 2010 in which Brian Kelly took no contributions for support, you may choose to give as much as $100.00 to the campaign. This is not the thrust of this web site, which is more interested in getting the message out. The most important message is "throw the bums out." By reading the full content of Jobs! Jobs! Jobs!, like Brian Kelly, you too will get an appreciation about Jobs that you may never have had before. Kelly wants to create jobs in the US and in NEPA in particular and he outlines how it can be done when Congress finally wants it to be done. So far, as you well know, Congress has avoided its responsibility of helping Americans in need of jobs. For years, they have either taken no action or given more rights to foreigners and International corporations. Instead of being a force to help the American people, Congress, especially the past 111th Congress when it was in session has chosen special interests over the needs of the American people. So far, the 112th Congress talks a goo game but they have done little to help the people. Te 111th Congress, and now it seems the 112th Congress have permitted unbridled corporate profits while the same corporations are shipping jobs overseas or bringing in foreign workers to replace Americans in their enterprises. This is not fair. That is why Brian Kelly is running for the Senate -- to change the Jobs scenario and many other scenarios that work against the people. Kelly thinks jobs are more important than special interests. Don't you agree? Why not pick a person for the Senate like you, who thinks like you do?